There is two ways (that I know) you can access the sketcher: from the Sketcher workbench itself or from the Part Design workbench. I will try this second option. Let's start again a fresh FreeCAD session in the Part Design workbench. When the Part Design workbench is active, you are working in 3D unless you decide to switch temporary to a 2D view, the sketcher. It is a way to work in a specific plane of your part: (x,y), (x,z) or (y,z) or any other reference surface of the design you are working on. At this point, I would recommend you to read the official documentation on the Sketcher. It really explains in details what you need to know when creating a sketch and adding constraints. One more time, I am not going to repeat what is already documented. What is really important to understand at this point is the workflow between Part Design workbench and Sketcher workbench. From the Part design workbench, you need to find out the "Create New or Edit Sketch" button. Once the button is clicked, a dialog will propose you to create (if it does not exists) a new sketch in a specific plane. Once you validate it, you enter the sketcher workbench. Notice the grid. Take time to design some kind of shape within the sketcher. Be careful: most of the time, you will need to create a pad, revolution from your sketch so it needs to be closed. For that reason, I would suggest to create a simple square or circle sketch first. Now press on "Close the editing of the sketch" icon. You are back to your 3D view with your sketch. If your sketch is properly closed, you will be able to create a pad or make a revolution for instance. This is the workflow: enter "Part Design Workbench", "Create a sketch", "Close the sketch", apply some geometric transformation to your sketch. That's it. Here is a 5 minutes design to illustrate the idea. The sketch on the right side looks like an R (for robotics!) 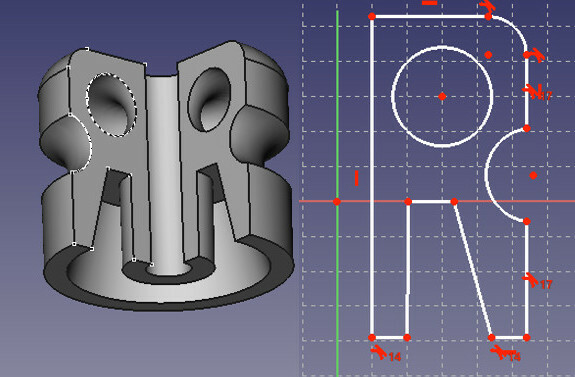 and then a 270 degree revolution around the (y,z) axis to get my part. Right now, FreeCAD 0.14 is far better than the previous release and very stable. It did not crashed at least once!! !